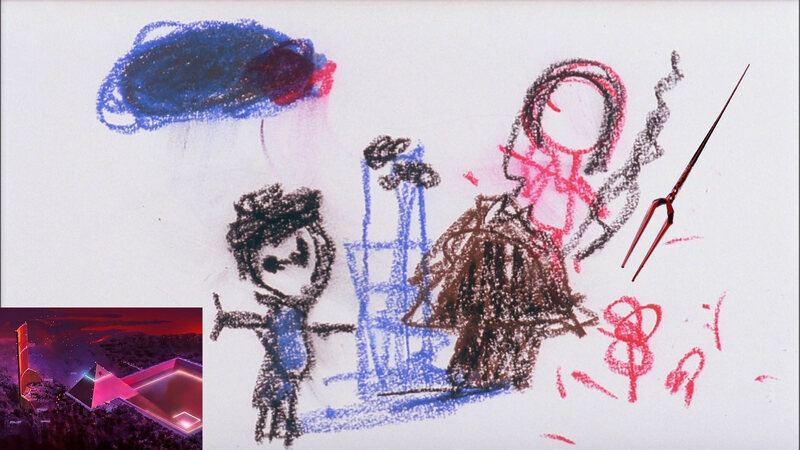 As Shinji chokes Asuka's postmortem soul into an even greater state of death, and global instrumentality begins, some familiar crayon drawings appear on the screen. Immediately afterwards, all of Evangelion's episode titles flash on the screen. Here is the scene I'm talking about. 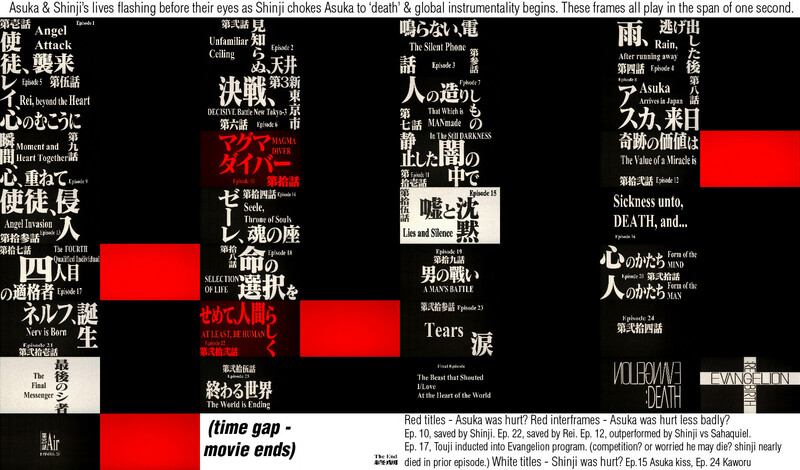 I noticed that those episode titles are colored in a way which corresponds with Asuka and possibly Shinji's memories. The way it seems to me is that their lives are flashing before their eyes before they die. The red and white title frames appear to directly correspond to landmarks in Asuka and Shinji's experiences during NGE. The red interframes I don't understand. I'm also not totally confident that the white frames are related to Shinji though it seems likely. The episode titles are straightforward enough, but what about those crayon drawings? It stands to reason that they should be related to their memories also. I have very little idea about these things. There's a persistent rumor that they were done by traumatized children and Anno received rights to them, but I've found zero evidence of any kind for that. The images also have a consistent style, and to me they appear to be professional work by trained artists who are only imitating the drawing abilities of children. I believe the pink figure who stands higher in the first image is probably Asuka, and the blue figure is probably Shinji. In the first image, crayola Asuka seems to be holding a Lance of Longinus and possibly standing on the geofront's pyramid. This is the one that really reeks of a past timeline to me. Something like: Asuka as a child having dreams of the past timeline and drawing it, without understanding it. Beyond this I don't have any breakaway ideas. Some of the images appear to depict domestic violence or murder. A while ago I found a possible recurring figure who dual wields bladed weapons in Asuka's memories. Maybe the person stabbing people in the crayon drawings is that guy. 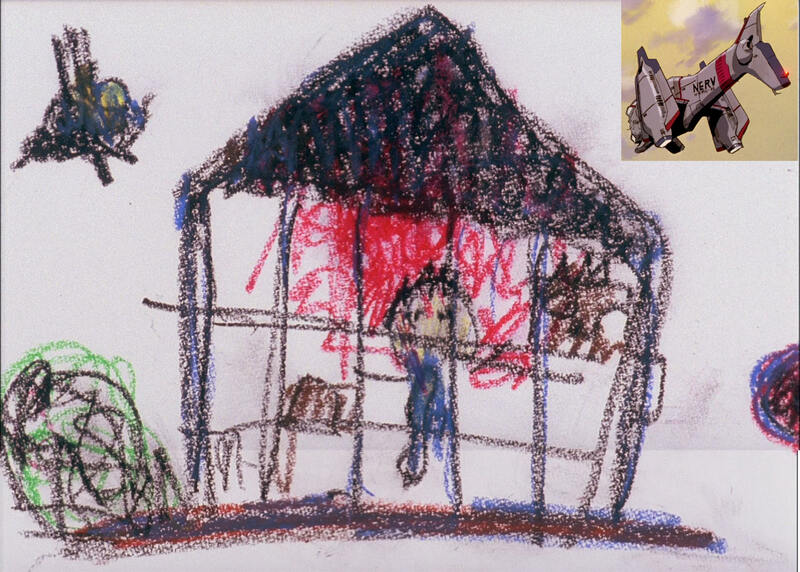 It's possible these are therapy drawings by Asuka during psychiatric treatment as a child. I also have some far fetched theories about the drawings related to timelines. One of the images appears to depict Shinji and Asuka together, and we know of an 'alternate universe' in which they were childhood friends. I need help figuring out what this all means. Both the episode title sequence and the drawings. I don't know if the drawings will ever be figured out but it's worth trying, for fun if nothing else. I want to go over these drawings, interpret them as something a traumatized child would make, and then interpret them as they potentially connect to Neon Genesis Evangelion. For the sake of this analysis, I will assume that all the drawings are by the same child. Sharp toothed red face with yellow eyes - Likely the abuser, the person the child most fears. Yellow and red are instinctively frightening colours, and that plus the sharp teeth and yellow eyes indicate that this child sees their abuser as an animalistic, foreign threat. Red figure interacting with a child - This shows a red character, who may be the same person as Sharptooth McRedface, doing something to someone shorter than them. The biggest difference children notice between themselves and adults is height, so this is very likely the abuser and the artist. The artist appears to be a girl, based on how the hair is drawn (remember giving long hair to stick figures to show they were girls as a kid?). The abuser's hand is in the middle of her forehead, and her mouth is open, suggesting this may be mid-hit. The boy in the house - This image depicts a boy in a blue shirt with short black hair in a house, surrounded by blood. I first interpreted this as the house being on fire, but when a kid draws a house on fire, they draw flames consuming the whole thing, going over the roof and everything, and this is only in one place, so this has to be blood. This boy has a red mark in the middle of his forehead, suggesting he was also hit. This shows that the abuser, who I will refer to as Sharptooth, is violent to more than one person than the girl, and that the previous image does in fact depict an act of violence. Woman attacked - This shows a different person, a black figure possibly wearing a top-hat, attacking a woman with a blade of some sort, and her bleeding from her hands, midsection, and forehead. Again, we see a forehead wound, more evidence that this was all drawn by the same child, as the forehead is a strangely specific place to be wounded, and not a place many children would think of as significant. The woman appears to have a knife or garden trowel on her, suggesting she intended to fight back, possibly knowing about the attack beforehand. Dead dog - This is a very detailed drawing, likely done when the child was older, as it looks much different from the first few pictures. The dog is lying on it's side, it's chest open, exposing it's ribcage and guts, and bleeding on the grass. This may be something that the child just saw one day by chance and remembered for whatever reason, as the dog has no forehead wound, and the red attacker is not a killer, and the black attacker is never depicted attacking animals, even though the black attacker has previously been shown wounding a midsection. The two meet - The boy and the girl from the previous drawings are shown together for the only time here. The girl is on the roof of a house, next to the chimney (the smoke is a big hint). The boy is on the ground, with something, likely a rain cloud, above him. The girl may be hiding from the red abuser, the boy possibly looking for her. Fish in a bucket - Again, another very detailed drawing. Two fish are swimming in a water-filled bucket on a sunny day. Once again, this doesn't seem to have any bearing on the meta-narrative of the two children and the two attackers, but it could portray a feeling of being trapped, and the fact that there are two fish and two abused children speaks volumes. Severed fish head in a jar - If my thoughts that the two small fish represent the children, this one big fish, murdered, speaks volumes. Remember the woman who was attacked by the black figure? Perhaps she was killed in that attack, represented by this dead fish. By this point, the recurring forehead-wound motif is gone. Sharp tooth - This bears a striking resemblance to Evangelion Unit 01 after the Zeruel fight, when it's been captured and put back in the cage. Note the huge, round eyes and giant, disproportionate teeth. Red figure with child - Possibly Asuka as a child being abused by her mother after the Contact Experiment, but as far as we know, until she killed herself, Kyoko was confined to a hospital bed, and the red figure seems to be standing. Boy in a house - This one, I'll have to make a stretch with. Shinji is never physically injured to the point he's bleeding out like this, and there's an overwhelming use of black not seen in other drawings. I think this is Shinji in the dormant Unit 01 after being consumed by Leleil's Dirac Sea. The boy seems trapped in the house and in bad physical condition, just like Shinji was trapped in the Entry Plug, running out of oxygen and slowly being reverted into LCL. The attacker and the woman - Not really sure here, but this may represent Gendo. Gendo is the cause of the death of so many female characters over the course of the series. He's the head of NERV, and likely the one that gave the go-ahead for both Yui and Kyoko's Contact Experiment, and likely even the one with Adam at the South Pole. He allowed Rei to run loose in NERV HQ, which led to the older Dr. Ikagi's suicide. He straight up shoots Ritsuko. The black attacker is likely Gendo Ikari. Dead dog - I really can't find anything this relates to, this image's meaning is really eluding me. The two meet - Your thoughts on this one are what made me want to look over these in the first place. If the girl is Asuka and the boy is Shinji, this really could be a previous timeline or a parallel universe where Asuka did to NERV HQ's surface pyramid what Shinji did in New Theatrical. She's accompanied by Shinji, which means they were both forced to attack Bardiel, undoubtedly murdering the pilot (whoever that may be in this timeline), and wanting revenge on Gendo. Fish in a bucket - Both Shinji and Asuka are psychologically trapped piloting Evangelion, it's the only thing that gives their lives meaning. The sunny day could represent the real world outside of their minds. Fish head - Both Shinji and Asuka's mother are dead, but this one dead fish seems to hint at a single, deceased ancestor. Why would the First Ancestral Race send out the Moons if not to keep their species alive, Superman style? I believe that this dead fish is the FAR. Sleeping cat - Unknown once again. Possible relation to Ritsuko and her cat obsession? Stop light- Shinji does things only because he's told to, and will stop only because he's told to stop. This stop light represents someone telling Shinji to stop, possibly to stop running. This stop light could be Misato. And that's it. That took way too long and I'm probably wrong about a ton of things, but it was fun to do anyway.